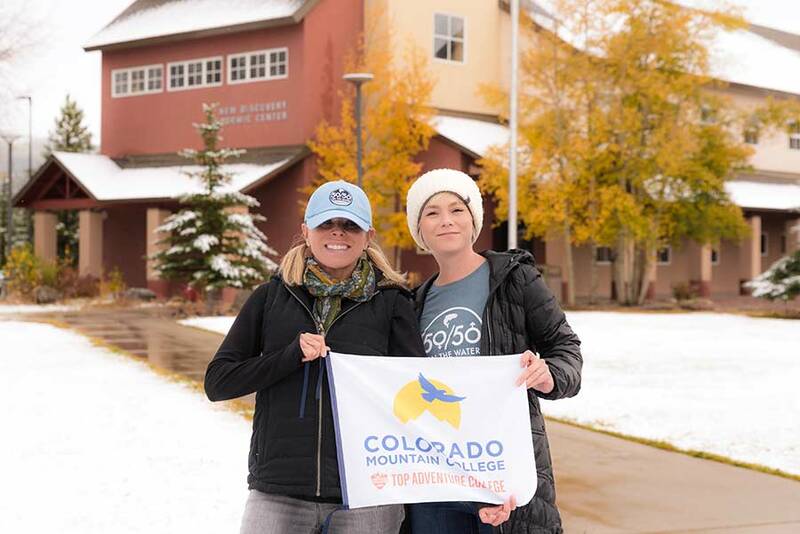 Kaitlin Boyer (right) and Robin Schmidt are working to bring more women through the guide school at Colorado Mountain College. There’s an old saying that “When women support each other, incredible things happen,” and until recently, I hadn’t fully exercised this concept, nor did I know how. Sometimes, it takes an unprecedented experience to fully bring things into perspective. Before I started my career as a fly-fishing guide, introducing more women to fly fishing wasn’t at the top of my list of priorities. I enjoyed the occasional day on the water with a girlfriend or two, but beyond that, getting more women in the sport meant more people on the banks of my favorite river, and that’s the last thing any sensible angler would want. Something shifted though. Maybe it was the altitude, maybe it was the loneliness, maybe it was being with a group of guys for six weeks straight. In 2017, when I went to guide school at Colorado Mountain College in Leadville, Colorado, I went in with a secret: I didn’t want to be the only woman there. I had little daydreams about making a new friend, whom I would sit next to in class, make inside jokes with, and go fishing with on the weekends. But when all the students filed in the classroom on my first day at CMC, it was clear I would be the only full-time female in the program. Kaitlin Boyer makes a point during a class on fixing fly-casting errors. 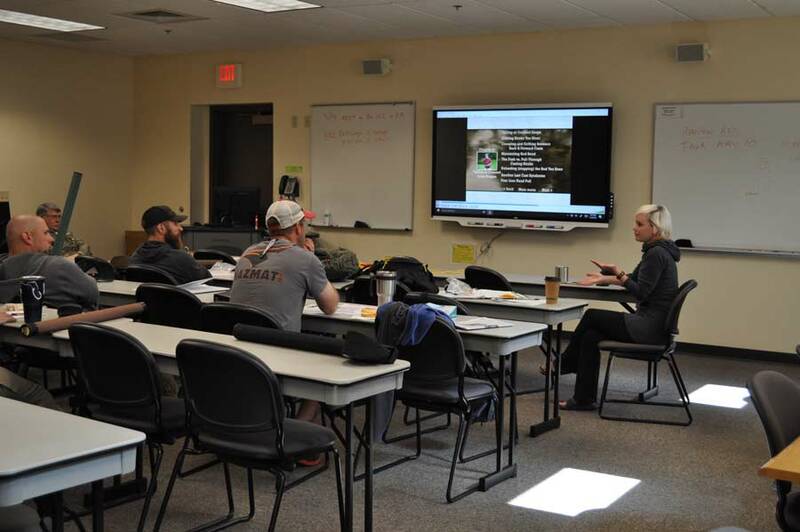 The Professional Fly Fishing Guide Certification Program at the Colorado Mountain College, Leadville campus is a college-accredited guide-certification program for aspiring fly-fishing guides. Thirteen college credits are compacted into six intensive weeks, during which students plow through classes such as Outdoor Leadership, Aquatic Entomology, Small Business Management, Fly Tying, and a two-part Fly Fishing Guide course. The program appealed to me because it sounded more like an adventure school than a guide school. The alternative programs that local fly shops often offer seemed too conventional. But an all-immersive, college-accredited program on the Arkansas headwaters at 10,000 feet, surrounded by Colorado’s most stunning fourteeners? There wasn’t a doubt in my mind about enrolling at CMC’s program. When it was all said and done, I walked away from the program with a new outlook as an angler. Despite loving every second of my time in the program, I still wondered what it would have been like if I had had another woman to connect with during my time there. When I heard about Robin Schmidt, a newly enrolled female student for 2018 the CMC guide program, my first instinct was to network with her and share my experience at the program, so she would know what she’s getting into. Robin was the only female member of the 2018 class, as Kaitlin had been in 2017. After many long conversations with Robin, I found myself on the sidelines of the 2018 program cheering her on, and we bonded over the fact that she, too, was the only female in her class. When she graduated, even though she walked away with a feeling of accomplishment, it was overshadowed by an underlying desire for change—change not only for the CMC guide program, but change for the whole fly-fishing industry. 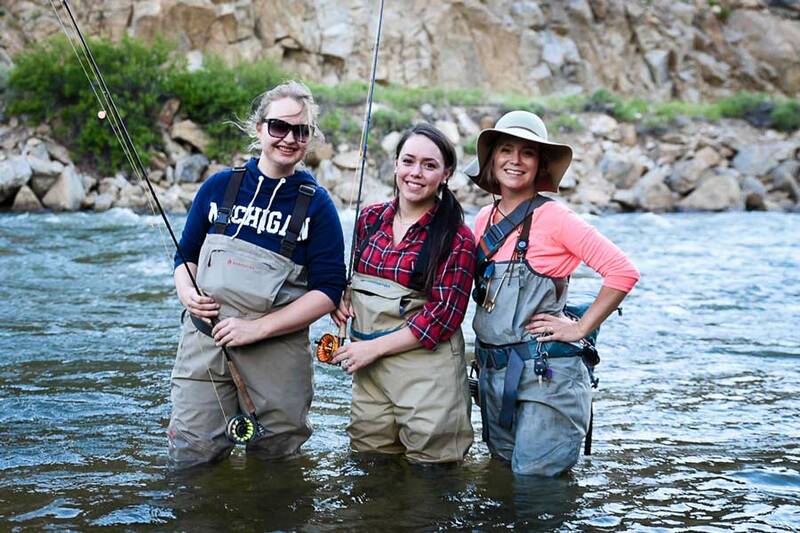 It was obvious to us both that guide programs could use more women, and since women are the fastest growing demographic in fly fishing, the industry is more than ready to accommodate more female guides. In the spring of 2018, Robin and I joined forces and have partnered with the CMC Foundation and Orvis’ 50/50 On the Water initiative to create a series of scholarships for women to attend the 2019 CMC guide program. Orvis has made a very generous in-kind donation, which includes two gear packages that consist of a Helios 3 Rod Outfit, Women’s Ultralight Waders, Women’s Ultralight Wading Boots, a Women’s PRO Wading Jacket, and a 50/50 On the Water hat and t-shirt. This is the perfect setup for a new guide going into the industry. In addition to the Orvis gear scholarship, we are in the process of raising funds with the CMC Foundation for a tuition scholarship for two women to attend the 2019 CMC guide program. That said, funds must be raised before the tuition scholarship is awarded, so at this time we are exploring several grant opportunities, and different avenues of fundraising. Robin takes part of her on-the-water final exam last May. Riding this dream with Robin and has been the most rewarding journey of all, and watching it unfold into opportunities for women has nourished a hungry aspect of ourselves that we didn’t even realize was there. We are now asking our community of fellow anglers to join us, Orvis, 50/50 On the Water, and the CMC Foundation to help bring gender equality to an industry that so needs it. To learn more and to donate, visit the Female Fly Fishing Scholarship Fund website. 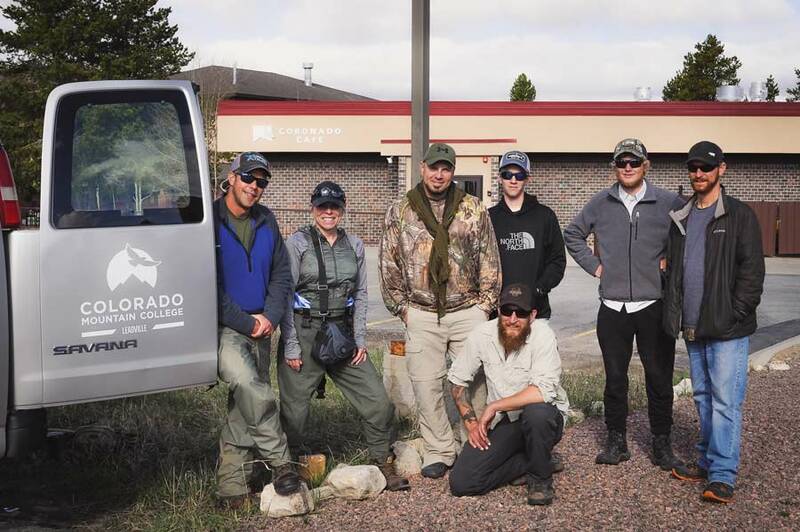 The Colorado Mountain College Professional Fly Fishing Guide Program website has all the information you need to know about the program itself. Kaitlin Boyer is a fly-fishing guide at Angler’s Covey in Colorado Springs, and she runs Pixel Kate Studios. Kaitlin enjoys introducing women to the sport in her job as a fly-fishing guide on the Front Range. I absolutely love this article! There are truly not enough women in the industry. I am the sole owner of Missouri River Outfitters in Montana and am so honored to be surrounded by my fellow female comrades. I can’t count how many times I get asked; “how long have you guys owned the company”, “are you married”, or just ignore me comply and turn to one of my male staff for answers to questions. We are always hiring more strong, able women and men to join the team. We are not a fishing company but do multi days in canoes. Y’all should come check out the Missouri River breaks! I’ll hook it up with some equipment. Well Done Orvis! 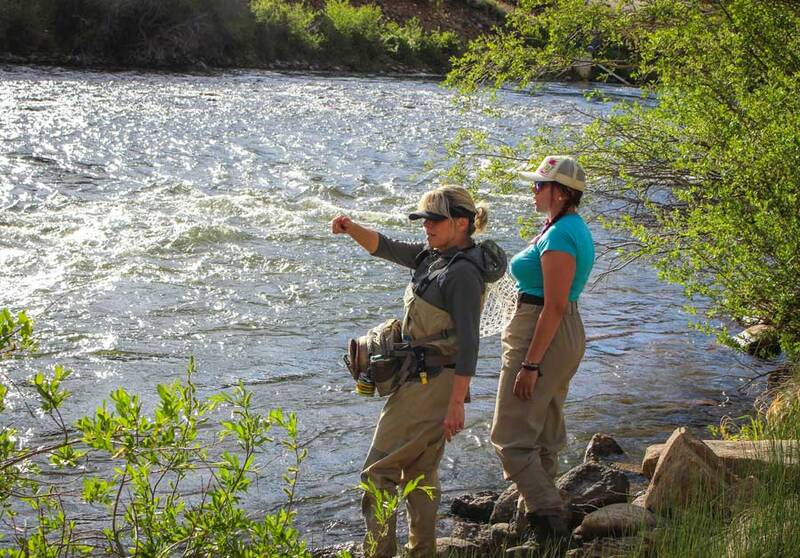 It’s fantastic to read about opportunities for women in fly fishing – and I’m amazed,and enlightened, to read here that women are the fastest growing demographic! I’m a fly fisher gal from South Africa and ,sadly, we really struggle to get ladies into our amazing sport, especially in the teenage and young adult years. In 2011 ,I initated the first ever rural community fly fishing project in SA (www.thendelaflyfishing.co.za) and this article has given me much food for thought going forward in the project.